Valour IT - Keep It Going Air Force! When I opened up my email and found this photo, I couldn't help but feel proud of the work we're doing out here. In the short time our team has been in Iraq we've all had our share of successes and failures. Two of the three aircraft you see in the photo wouldn't be operational had it not been for the hard work of Capt Thomas Wegner here in CAFTT. 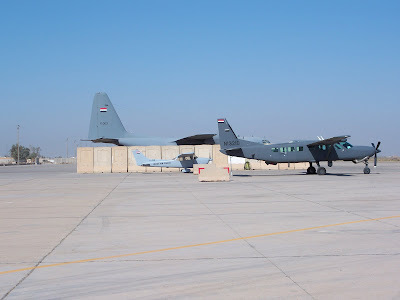 The first airplane, the Cessna Caravan, is proving an excellent ISR and light transport platform for the Iraqi Air Force. The second, a Cessna 172, just arrived and is now training the newest Iraqi Air Force Pilots.... the future of the new Iraqi Air Force. The C-130 hiding back there is one of my programs, and trust me, it's been a love-hate relationship. The Air Mobility program is a great success for the Iraqi and US Air Forces, but it's also a tough aircraft for the Iraqi Air Force to fund. They're always hesitant to spend money on maintaining their aircraft, and the C-130 is an expensive aircraft to maintain. I think our organization has spent more time dealing with the Iraqis and their C-130 contracting and money issues than on any other case, with little to show for it other than total exhaustion on our part. Their helicopters are a whole other issue that I hope to discuss some day in the near future onec things progress out here. As of now, every helicopter issue I've worked hard to support them on has in one way or another fallen apart. They have excellent, well trained, and experienced pilots flying their current helicopters, and their maintainers haven't missed a beat returning to the IqAF to work on the same types of systems they spent years working on before. I can honestly say that the Iraqi Air Force Pilots, Maintainers, Base and Squadron Commanders.... from the Air Staff down the chain, are honest and hardworking people, and outstanding Airmen. You'd think everything should be working out great because of such excellent IqAF Airmen, but they're not. Some day I'll elaborate more, but for now just know that we're experiencing both failures and success in helping the Iraqi Air Force. We're all tired. Exhausted. Frustrated. Ready to pack it up and get out of dodge. Yet, after walking out of yet another meeting where I found out so much of our effort has gone to waste, I opened up an email and found the picture above. For a brief moment it gave me a smile and a renewed sense of pride. This place is frustrating, and I sometimes find myself doubting why I ever came here and whether or not it was worth it. I know it's worth it. The good and the bad. Success and failure. I think I'm just growing tired and losing sight of the big picture.